We sit around several long tables placed end-to-end so we can see each other, like a big family Thanksgiving table. We keep growing, so I imagine, one day, some of us will have to sit at the kids' table. Until then, we're one happy and together group. 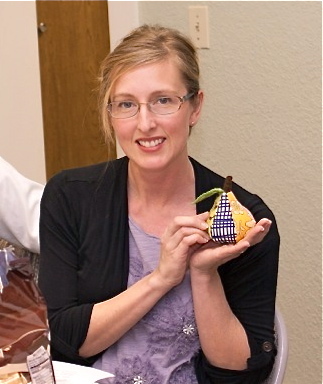 While most of the chatter was about QuiltCon, which starts this week, we had a group discussion about thread. How much could you possible say about thread? You'd be surprised. It's amazing how many different brands are on the market. And while there were many commonalities among the group, we all have our own individual preferences and we like what we like and it works for us. The main idea I came away with from the discussion was that sometimes our sewing machines are finicky and you have to find the right thread not only for you, but for your machine as well. We also had a BIG ANNOUNCEMENT! 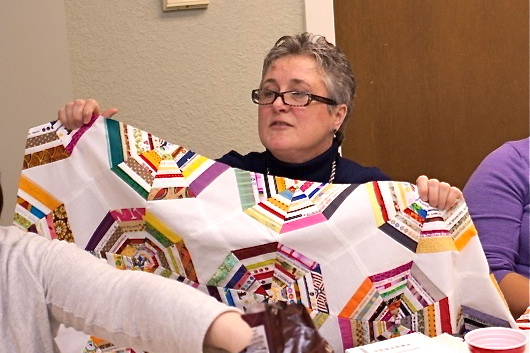 June 14-16, 2013 will be our next QUILT RETREAT! 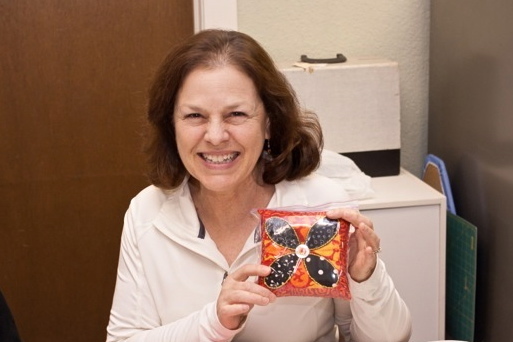 We'll be going to Bluebird Lane Scrapbooking and Craft Retreat again, which is a fabulous place! Check out the EVENTS tab on the Private Facebook page for additional details/price/times and sign up to attend! And because I can't remember what else was said...on to Show & Share! Shana's pincushion. Yes, there's cupcake fabric! Elizabeth's pincushion. She made another in a different color. Hmmm....I wonder if she's keeping that one for herself? This sweet little thing is Amanda's handiwork. A gazillion french knots. Some of us are also participating in the Michael Miller Madrona Road Challenge. 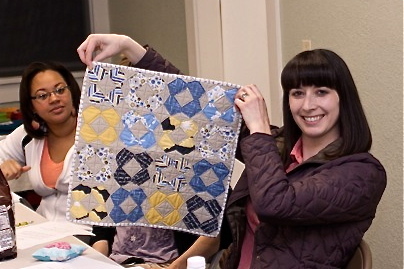 Here's Stephanie with her cute mini-quilt! 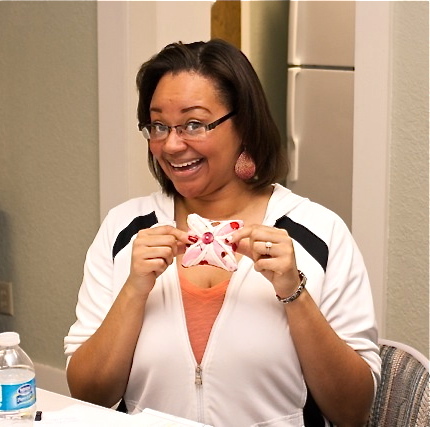 Jemellia was in charge of February's Block-of-the-Month. Angie just joined our group last month. 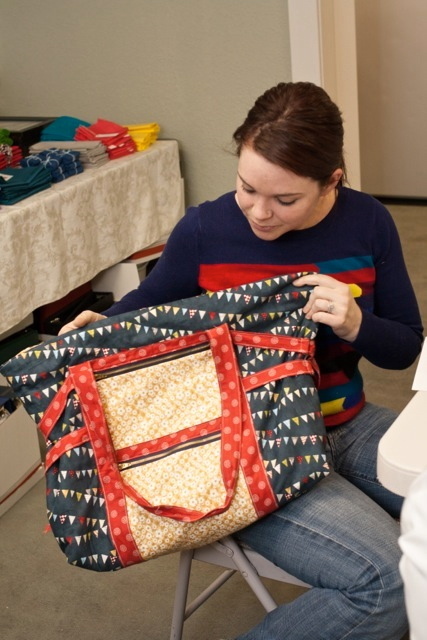 I don't know if she knows that several of us have been talking about making this Art Student Tote, pattern by Anna Maria Horner. And darn if she didn't beat us all to it. She did a beautiful job on it and now I'm re-inspired to make one myself. Agnes is working on a quilt using selvages. I know. Wow. 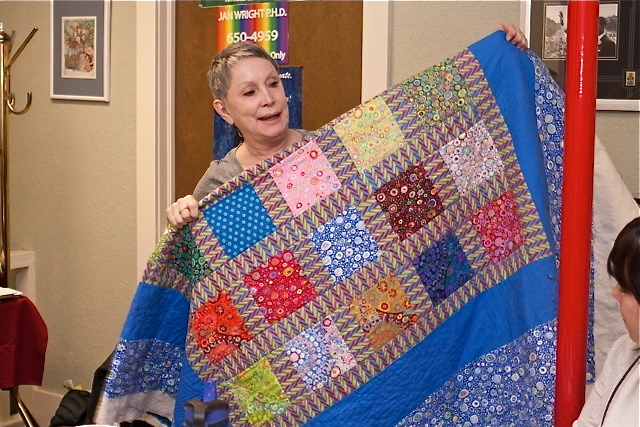 Mandy showed us the quilt she's making for her husband. You can't see it, but the blue border is hand-quilted with a large dragonflies. And if all that wasn't enough, we also had a couple of swaps. First, our Solid Fat Quarter Swap. Those participating bought 3 yards of one color. We had a sign up on Facebook so that we didn't duplicate colors. 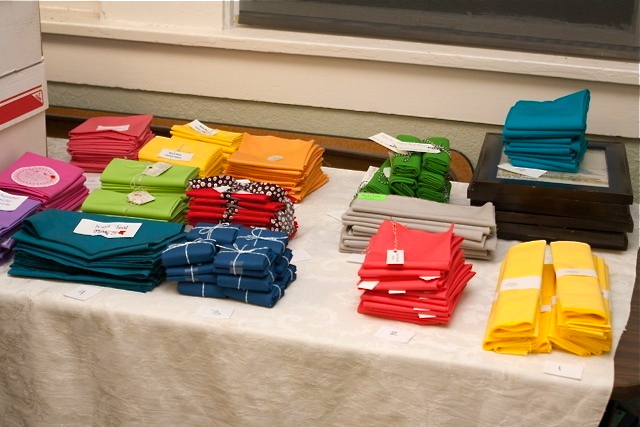 Then, we cut our yardage into fat quarters and tagged them with our name, fabric manufacturer and color. I know I tend to gravitate toward certain colors, so it was fun to come home with a dozen colors that I may not necessarily pick myself. Our second swap involved this sweet little girl. I think she likes those bright fat quarters. Looks like her mama is raising her right! Hope to see YOU at our next meeting! And keep an eye out for Flaunt Your Finish the last week of February! Oh my! I love that baby swapping picture! How sweet! 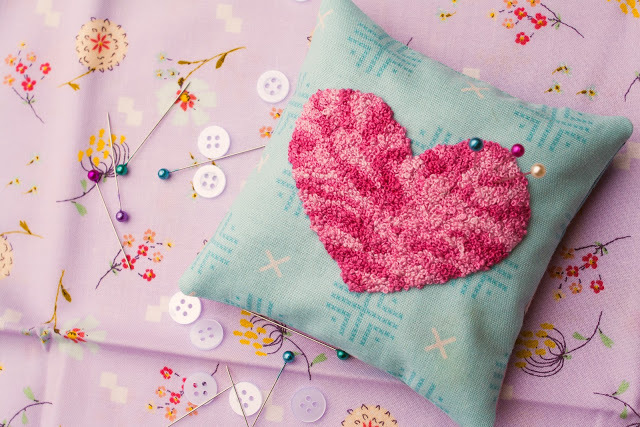 Everyone's pin cushions are lovely! 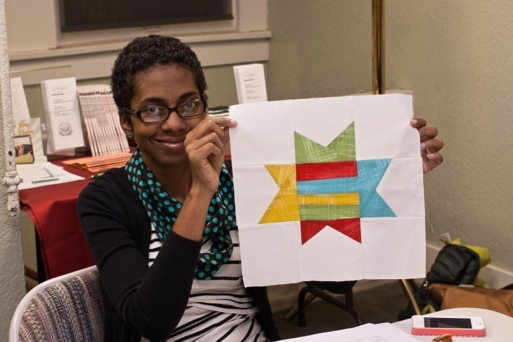 3 more days until QuiltCon!